At Knotting Hill Place you will find soaring ceilings adorned with crystal chandeliers at every turn. This 17,000-square foot estate is situated on five acres surrounded by beautiful trees and breathtaking landscaping. The forever green event lawn completes the package giving our clients the option of an indoor or outdoor event during any season. Our ballroom can accommodate up to 300 guests for a plated dinner. Included for your experience are tables, clear phantom chairs, crystal chandeliers, built-in bars, a grand staircase and giant video screen. It is also connected by a large retractable glass wall to our fantastic covered outdoor patio. The entire room has been excellently designed with connections and acoustics to support a large band or a variety of DJ services. A soaring barrel ceiling and natural light define the Cathedral Room, making it a perfect setting for your indoor ceremony. The old-world feeling comes out in a gorgeous entry door and unique stone features throughout. Seat up to 300 guests in this lovely, timeless place. Our massive event lawn is what truly sets us apart from any other outdoor venue in the area. 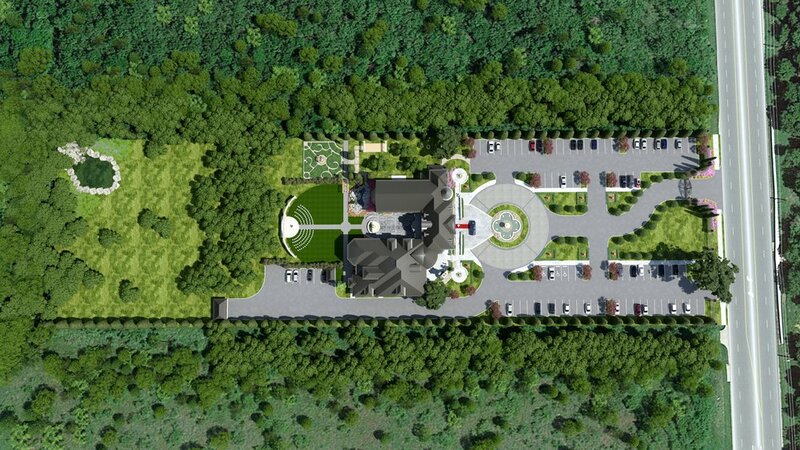 Surrounded by woods and unique water features, we will utilize synthetic grass and perfectly timed gardens for a lush landscaped atmosphere year-round. This large patio extends from the ballroom and wine tasting room and offers guests a warm place to relax by an exquisite fireplace. This versatile courtyard can be fashioned for intimate ceremonies, charming cocktail hours or tailored to your own vision. You and your guests will be welcomed by a bold red carpet and impressive double doors that open to a modern fire feature and crystal chandaliers. The understated style feels serene, welcoming, and effortlessly luxurious. Outfitted with old world class in a masculine style, this room is a perfect private retreat. 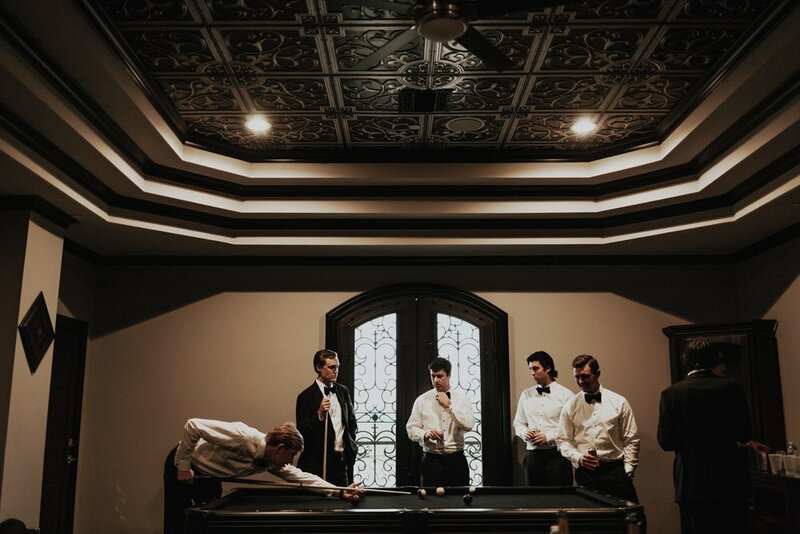 Complete with a pool and card tables, this room was made for memorable moments with friends. This elegant space was built for beauty. You'll find a raised étage for dressing, comfortable accommodations for friends, and salon-style seating with a gracious LED mirror for primping.